It has taken a long time for me to accept the oddball, weirdo, misfit, and unique person that I am. I used to strive to be a cookie-cutter version of someone else - it just seemed like the normal and correct thing for me to do. And even though I had moments of wanting to jump out of the "normal" box that I created for myself, I felt like I was being childish and silly for even wanting to do so. Through years of growing up, learning more about myself, and by becoming a mother, I have learned that life is way more fun when I chose to be my quirky self. When I embraced my likes and nerdy ways. When I stopped looking for the person in the crowd who heard my loud laugh (obviously they were taking the time to judge me, right?) or who might see me wearing my Minnie Mouse hoodie. Or even when I fearlessly stand next to my child who decided to dance in the mall (with no music) because she has not yet become aware of that weird want of "needing" to be accepted by society. If anything, my little three year old loves to stand out. Her actions seem to indicate that she prefers to make someone laugh or smile at any given chance. And if they don't, who cares? She doesn't and besides that is their problem anyways. I have realized over time and many opportunities that I really do enjoy dancing with her in the middle of mall. With or without music. I have started to stop looking for reactions from a crowd and instead to just focus on her, or look at my husband, because he has already very welcomely accepted the oddball that I am. I have learned to get overly excited about the small stuff with my little girl, about the finding of the large Yoda statue or having no shame over taking many selfies with all the cute, pretty, and weird things that we find. I enjoy being this fearless person when I am around her, and that is something that I want to pursue, and to continually encourage within her. I want her to know that she is unique and to never fear that it's a bad thing. I want her to fully embrace her passions, her loves, and her character. I want her to grow up with such confidence that she never has to try and fit into any box built from anyone else's standards. That is my hope for my little girl and I know that I am a big step in that. I want her to know just how odd I am, and I want her to see the joy that I have that comes from being just that. 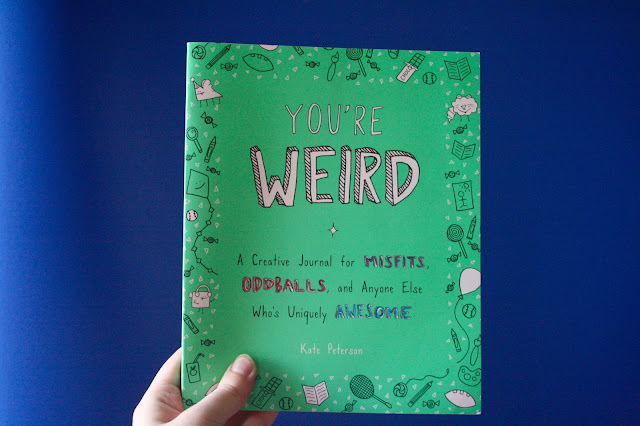 When Kate Peterson asked me if I wanted to review her book "Your Weird: A Creative Journal for Misfits, Oddballs, and Anyone Else Who's Uniquely Awesome" I was ecstatic. Not only have I been watching Kate's career since she came onto my blog a few years ago as part of the Maker Series, but this creative colouring book and journal was already on my radar as something that I NEEDED to have. 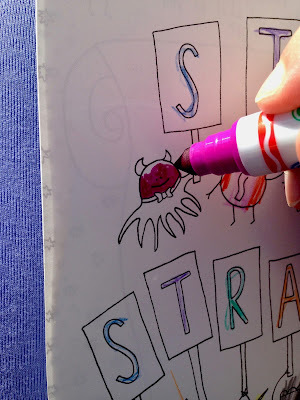 After receiving and opening it, I realized quickly just how much I wanted to take part in this book with my little girl, as well as share it on the blog with anyone else who may find enjoyment in being an oddball like me. 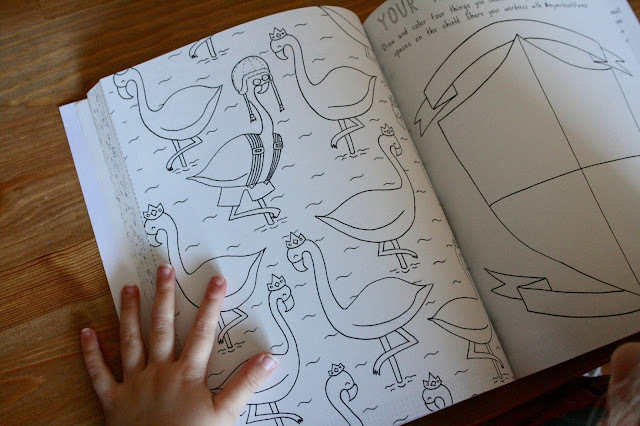 With pages full of colouring opportunities, fun worksheets that ask what kind of pizza you'd be, and opportunities to explore deeper thoughts, this is the type of book that I can pick up no matter what mood I am in. To colour. To write. To explore. Or to even just ponder a question. 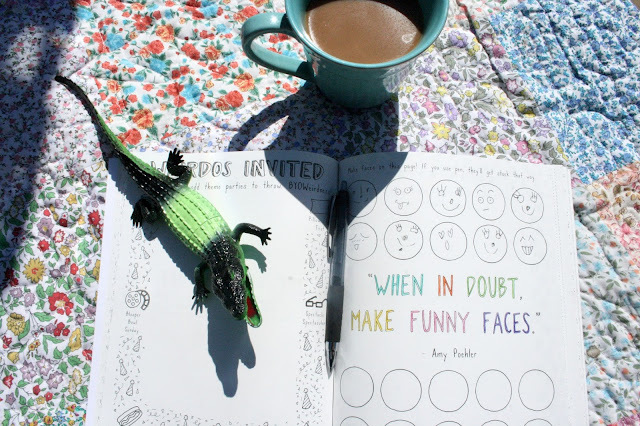 This is the book that I want to carry around with me always, to encourage silliness, and to encourage colouring and thinking "outside the lines." 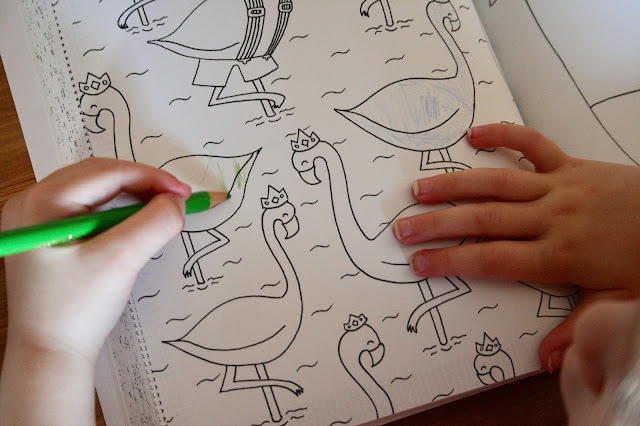 Right away, my girl found a flamingo page and decided to colour them many different colours. She has worked so hard on that page and she has told me over and over again that it's not yet finished - she is trying to figure out if she should colour the water pink or orange. I enjoy how interactive it is. I love being able to read out questions or statements to my girl and to hear how she responds whether in smile, thought, or question. She loves that she is "hereby granted permission to wear whatever odd pieces of fabric strike his or her fancy, which shall include cases where said outfit brings him or her joy while evoking the disapproval of others, especially parental units, and shall also encompass emergencies created by shortage of clean laundry. "- that is definitely going in her room where she can see it and remind me of it always. 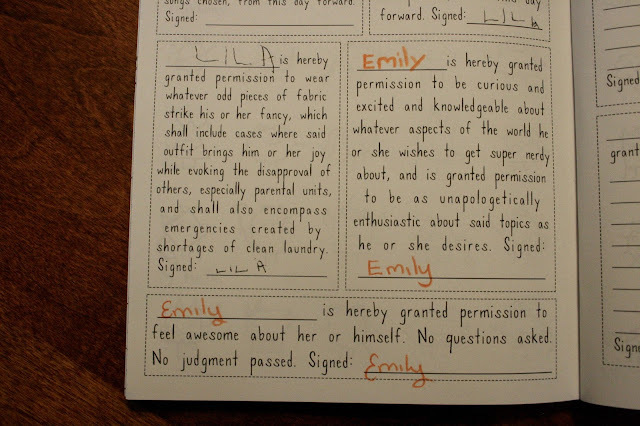 I also enjoy that I don't feel the pressure of having to fill out the pages right away. I can write a few sentences and move on to colouring, or close the book altogether, coming back when I have more thoughts and ideas. This book is a creative work in progress, just like me, and I am excited to see it full one day. 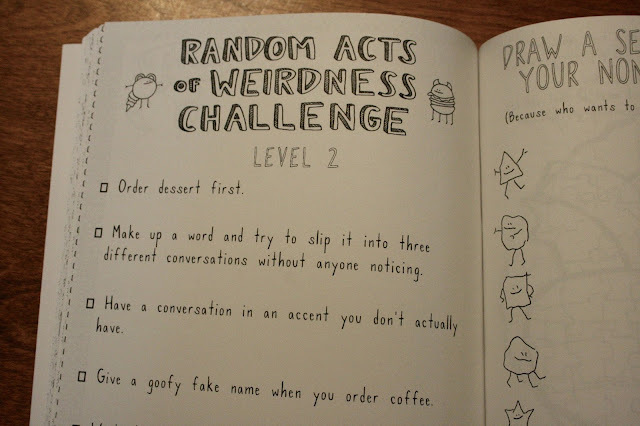 After playing and perusing it for several weeks, I can honestly say that I am smitten with this entire concept of encouraging everyone to "be weird." I enjoy how interactive and playful it is while still asking some of the bigger questions (example: "what, if anything, prevents you from being your authentic self?"). I love how excited Bug gets when I pull out the book. 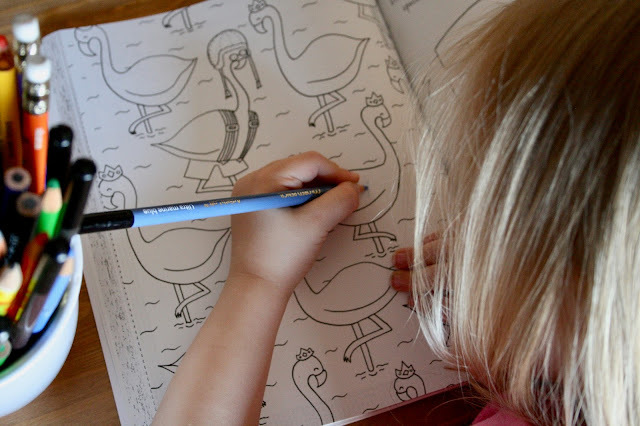 Whether she wants to continue working on the flamingos or find a new page to explore, the end goal doesn't matter. The fact that we have spent quality time together within the pages of this book does. I highly recommend this book to anyone who considers himself/herself an oddball or who is looking to figure out just how they can fearlessly accept themselves as they are. - I love Disney and want to fill my home with small tokens of that world. - I really enjoy reading Fantasy over fiction. Heck, I really enjoy reading YA and Children chapter books. - I want to make my house a jungle and fill it with all of the plants. - I dream of owning chickens and alpacas. - I like watching movies about monkeys or villains or aliens or crazy weather taking over the planet because I know the likelihood of that ever happening is zero = my type of scary movie. 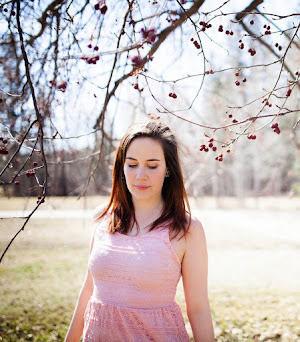 - I am an introvert and often need days to recoup after an afternoon out with people. - She would rather own a snake than a bunny. - She talks to ants, they are her friends. - She is a collector of rocks and sticks, sometimes flowers. - She could sit for hours befriending any animal. - She believes in dragons, unicorns, and mermaids. She thinks ghosts are funny. - She dances often to the music inside her head. Let's take a deeper look into "You're Weird" and have a conversation with Kate Peterson. 1. 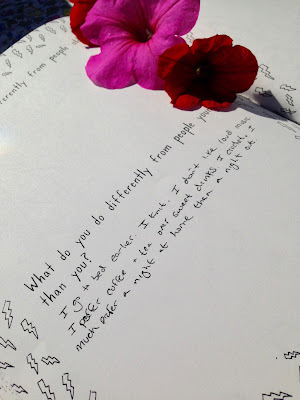 What was the inspiration behind the concept of You’re Weird? I set out to make “you're weird” a compliment. 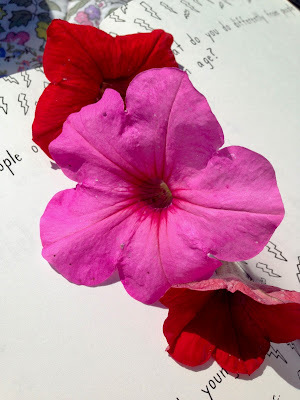 Advice to “be yourself” and platitudes like “different is beautiful” are everywhere; but equally ubiquitous is the evidence that many people don’t truly believe it, from schoolyard hierarchies to the insecurities that plague us all. Most people seem to secretly want to fit in a variation on the ideal mold shaped by our culture, and as a result, it seems to me that our cultural idea of “different” isn’t actually all that different at all. I want to spread the word that you don’t have to dress a certain way or project a certain identity or come from a particularly unconventional background to be unique; you just have to look at what made you who you are today and embrace it. In that way, we're all weird. And that's a really lovely thing to celebrate. 2. 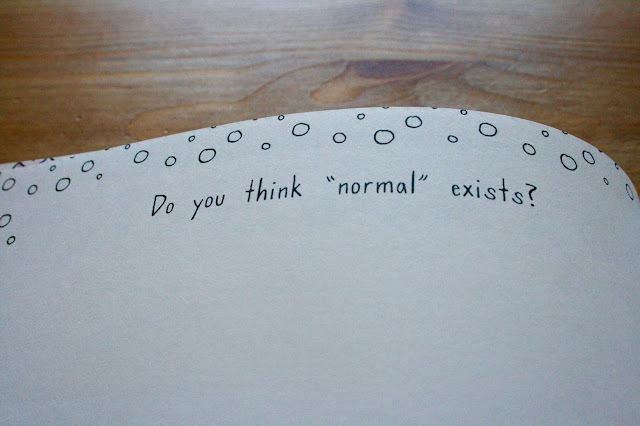 To ask one of the questions posed in your book, what is your definition of weird? My definition of “weird” is this: unapologetically unique. I picked the word “weird” as the centerpiece of this book because it goes farther than “different” or “special” or “unique,” and I want us all to go farther in how we think about and embrace uniqueness. Right now, most of us have gone as far as “be yourself,” and we have a very little idea of what that actually means. The command form of it seems to imply a sort of performance, but to say “I’m weird” is to just accept all the little aspects of who you are right now and let them hang out. I also love that the archaic meaning of the word “weird” relates to the Fates and means “one’s destiny.” It’s an invitation to take what makes you different and find purpose in it. Carpe weird! 3. Do you have words of encouragement for anyone who is being bullied by their peers? What saddens me the most about bullies is the fact that they take the coolest and most interesting things about the coolest and most interesting kids and try to turn them into negative things, all because they feel bad about themselves. Just remember this: the person who is bullying you wants to make you afraid and sad by calling you weird, but if you believe—really, truly believe—that being weird is awesome, all the bully’s power goes away. All you have to do is be proud of who you are (and, chances are, if you’re being called weird, you are an extra interesting and unique human, which is something to be proud of!). 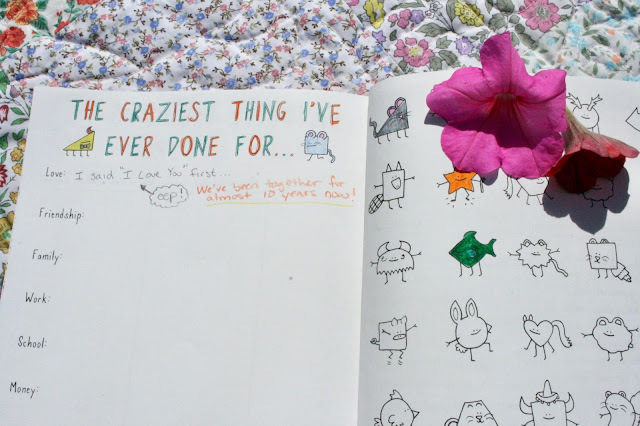 So, take out your journal and make a list of the things that make you weird and why you appreciate them. You can reread that list anytime you need a little reminder of why it’s awesome to be you. And finally, remember that the kids who are most different from everyone else grow up to be really awesome adults. Being different means you’re on the right track, and if you don't have people around you who see that right now, believe it extra hard yourself until you do. 4. 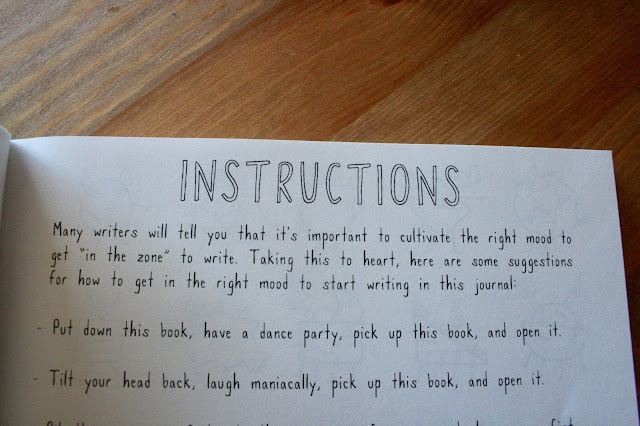 Did you learn anything about yourself when creating this book? The rough draft of this book was due two weeks before my wedding, and making it while getting ready to marry my best friend showed me all over again how lucky I am to have found the oddball who’s now my husband. There's that Dr. Seuss quote about love being like “falling in mutual weirdness,” and I know everyone thinks it seems like it was written for them and their partner; but seriously, I’m pretty sure it was written about Nate and I. We’re so weird, and I absolutely love it. I won't say “I couldn’t have done it without him” because, like the other people who say that, I’m smart and capable and I would have figured it out—but it would have been a lot less fun and a lot more stressful to make this book without my weird anchor around to keep me sane, and thinking about weirdness all day everyday while planning the wedding was exactly the right way to appreciate how amazing it is that we lived totally different lives before we met and somehow ended up fitting together like two seriously weirdly-shaped puzzle pieces. 5. What do you wish for readers to take away from this book? I hope readers will come away from this book with reasons to smile not just at the people they meet, but at themselves too—or make a funny face at themselves in the mirror. Or bust a move in front of those people they just met. Basically, that’s to say I hope they find the balance between not taking their weirdness too seriously and honoring it as the pretty remarkable thing it is. It’s a tough balance, but I think the best first step is defining your weirdness for yourself. Once you've done that and you know what it looks like, you can do with it as you will—parade it around, or only show it to people who earn it, or just let it hang out. Remember that it will change and evolve with you, and this is an ongoing process. But that’s part of what makes all this so much fun! 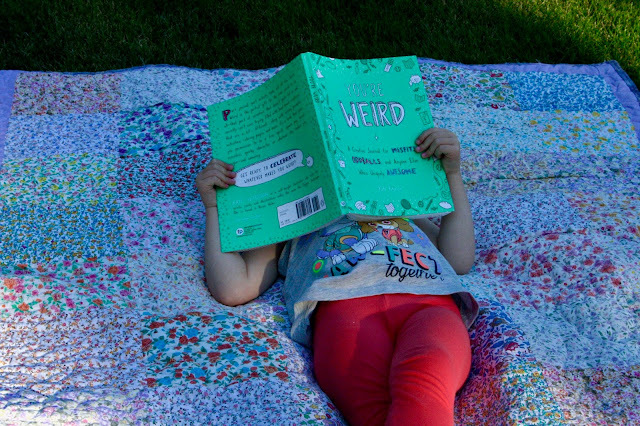 You can purchase a copy of "You're Weird" at the Penguin Random House or on Amazon. 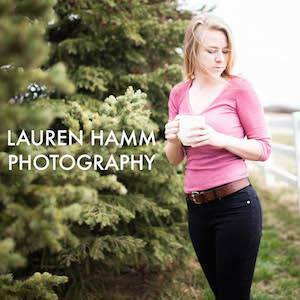 If you'd like to follow Kate Peterson's creative journey, here are some of her links : Instagram, Facebook, and Website. 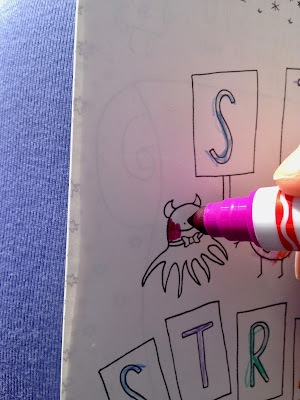 You can also take a look at the Maker's Series post that she did a couple of years back. I have enjoyed following her career up until now and I cannot wait to see what else Kate Peterson accomplishes.